Technology transfer process in pharmaceuticals from one manufacturing unit to another or from R&D to manufacturing unit. 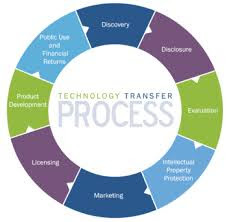 Technology transfer is the process by which the manufacturing process and analytical method are transferred from one manufacturing unit to another unit or from R&D to manufacturing unit. Technology transfer from R&D to manufacturing site is critical because of the scale-up of the product from pilot batch to large-scale commercial batch. 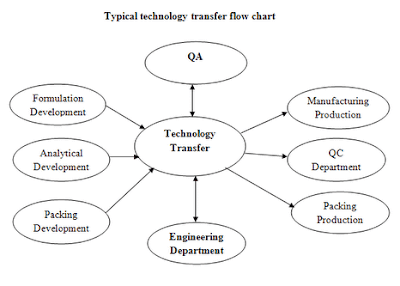 A typical technology transfer process can be divided into production part, quality control part and documentation part. Receiving unit and sending unit both should develop the product transfer protocol jointly to transfer the product related information. Information should be transferred according to the technical expertness of the staff and the manufacturing site capabilities to run the process smoothly. The material used for manufacturing on receiving unit should have consistency with the material used at the sanding unit. The properties of the raw material those can alter the quality of the product should be identified. Sending unit should provide the detailed information of manufacturing process, physical description, specification and in-process controls. History of the development of the product should also be provided for the further development or process optimization after the successful technology transfer. Information regarding the environment, health and safety should also be provided to the receiving unit. It should also include the information on product quality review, validation, stability and environmental conditions for manufacturing. Generally, trial batches are taken at the receiving unit to test the manufacturing parameters and capability of the manufacturing process before running the validation batch. All the information regarding the packing should be transferred as the manufacturing process. It includes the specification of foils or containers and closures, and other related information as design labeling, artwork and drawings. To prevent the contamination in the pharmaceutical products, it is essential the follow the adequate cleaning procedure. It can minimize the risk of cross-contamination during manufacturing. Receiving unit should validate the cleaning procedure and sending unit should provide the required information such as existing cleaning procedure, the solubility of all materials, therapeutic dose, the toxicity of the API, cleaning agents and recovery studies. Sending unit should provide the information related to the facility design. It should include the layout of facility, buildings, utility services, fire risk, health and safety requirements for operators and environmental issues. A list of required equipment with their make and models should be provided by the sending unto. It should include the manuals, drawings and cleaning, operating and maintenance procedures. IQ, OQ and PQ of the equipment should be done by the receiving unit. The analytical method has its own importance because the manufactured product shall be tested by the developed analytical method and accuracy in the analytical method can save time. Receiving unit should implement the method of analysis for the finished product, raw materials, packing materials and cleaning residues before the starting of the process validation. Analytical method transfer protocol should be prepared including responsibilities of both sanding unit and receiving unit, the specification of product, acceptance criteria, interpretation of results, report formats, reference standards and deviations during analysis. Training should be provided to the analysts and should be documented in training record. Every step followed during the technology transfer process should be documented and a summary report should be prepared to contain the conclusion of the technology transfer. Discrepancies found during the process should be listed and should be resolved by taking the appropriate action. Following documents should be prepared during the successful tech transfer.